This is a great snack to have around when you are getting a craving for something fried and greasy. These pepperoni bites will definitely satisfy you and they are baked! Kids also love'em too; plus they are so much healthier than the frozen ones at the supermarket. 1. Pre-heat the oven to 400. Lightly coat a 9” glass pie plate with cooking spray. 2. 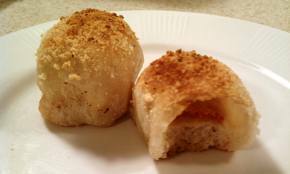 Unroll pizza crust dough and cut into 24 even pieces. Flatten a piece and mound about 2 teaspoons of cheese in the center. Fold a slice of pepperoni and place it on top of the cheese. Fold the edges of the dough around the cheese and pepperoni and press together to form a sealed ball. Place the ball, seam side down, on the prepared pie plate. Repeat with remaining dough pieces to create 24 balls, filling the pie plate. Valentine's Day Wish! 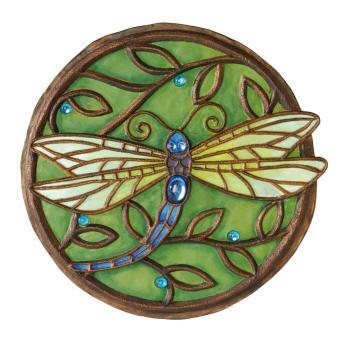 $100.00 Gift Certificate Giveaway! 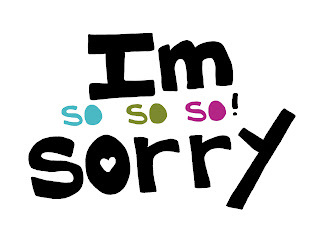 Do your friends and family offered say you are difficult to shop for? If the answer is yes, then we have a solution for you for Valentine's Day. 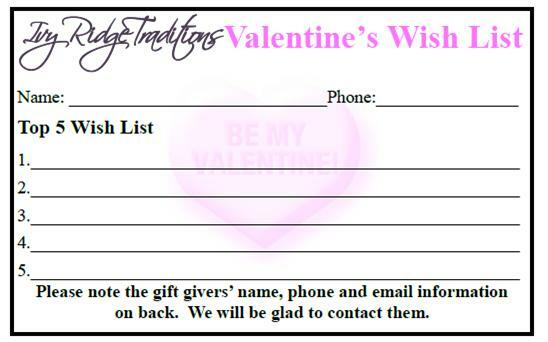 Starting now Ivy Ridge Traditions will be having a Valentine's Day registration for your top 5 wish list items! Simply stop by and fill out your registration list. 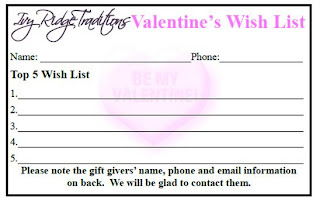 When you complete your information with at least 3 Wish List items, you will be entered to win a $100.00 Ivy Ridge Gift Certificate. 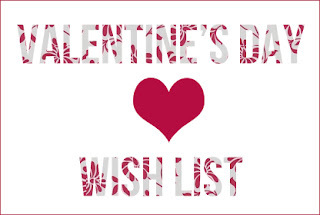 When your loved ones come to do their shopping for Valentine's Day....all they have to do is come in and give us a name which we will then look up and give them your Top 5 Wish List. When your special shoppers purchase an item from your Wish List, then they too will be register for a chance to win our $100.00 Gift Certificate as well. Hopefully, your Valentine's shopping will be a breeze! Back in the Blog Business! ... to not have a blog update in over 3 weeks. Over the last few weeks, I did not intentionally ignore our blog, rather I could not get the blog to upload any photographs. The "magic" upload an image box was just plain missing. Here did it go? Who knows!? This blog is not about my wonderful writing skills rather it is a look into our shop (soon to be two shops again) without getting in your car or leaving your desk, so photographs are important. You ask how did I fix it? I did not. I just kept trying to get it to work and magically the update image box appeared again. I have to come to conclusion that is how my life works whether it is my car making a goofy noise only when I drive it alone or the "magic blog box" is missing. No matter, we are back up and running. Here are a few of new arrivals that have been favorites! Do not hestiate to call the shop with any questions you may have about anything pictured below. The Dammit Doll has been a hit. 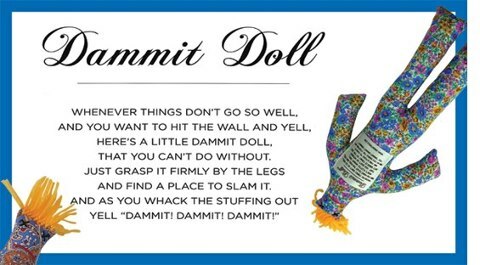 Everyone can think of a time in which these would come in handy. Gardening items are already arriving! These are great gifts to those looking forward to warm weather. WHOORAH HOOTS in Large and Small ~ These sweet little owls make a soft hoot sound that is adorable. 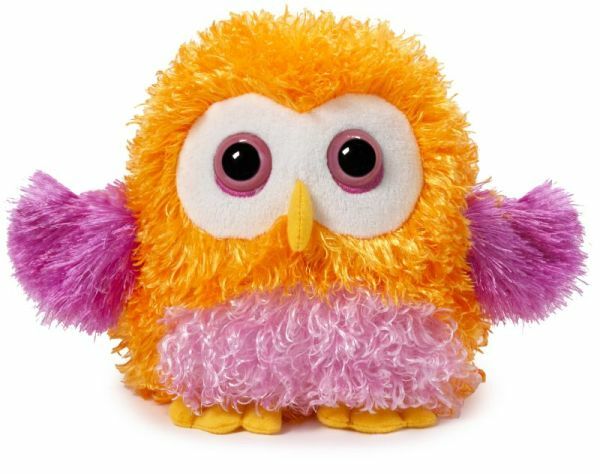 The sound is soft, so parents are happy with the sound level and children find it endearing. We have already sold several. These are a hit! Pandora's Valentine's Collection has just arrived! 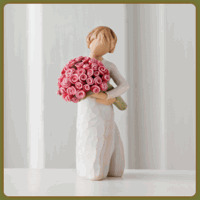 New Willow Tree Valentine's pieces are instock. There are two additional pieces that are beautiful. I would like encourage you to stop by and see them all in person.